We send all Gift Certificates via email to the billing email address. If you want it to a different email address, please indicate this in the Order and Shipping Instructions field when you are checking out. Paddle Palace Gift Certificates are a great gift for your favorite table tennis player! These are redeemable for any items at Paddle Palace. Gift Certificates are redeemable online, by phone, and by mail. There is no Shipping charge for Gift Certificates. We send all Gift Certificates by email to the billing email address. If you want it sent to a different email address, or if you also want a physical copy mailed to you, please indicate this in the Order and Shipping Instructions field (on the same page as the credit card entry when you are checking out). If you need the gift certificate mailed but not the catalog, you can also indicate that as well. Gift Certificates are emailed the same day or following business day from date ordered. Paddle Palace Gift Certificates are available in any denomination. 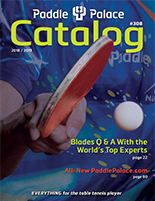 If you want a different dollar amount than is available on the dropdown online, please contact Paddle Palace by phone. I tell my wife to get me a Paddle Palace gift certificate every year. It is easy to redeem and the people at Paddle Palace are very nice. The first time I called and gave the number over the phone, but now I just enter the number when I check out online.